Where Hurricane Maria left devastation, the Kansas City Ballet School (KCBS) wants to bring hope of a bright future. The island of Puerto Rico endured the brunt of Hurricane Maria in September 2017. In the months since, KCBS has stepped up to assist with the disaster relief in a unique way — by helping their fellow dancers at the Mauro Youth Ballet in San Juan return to dance. “Keeping arts organizations running gives everyone who was affected by the natural disaster the opportunity to see beauty again,” said KCBS dance teacher Maureen Hall. KCBS collected new and used dancewear (such as leotards, tights, ballet shoes and pointe shoes) to get the students and teachers at Mauro back in uniform and held two donation-based classes to raise funds that will help Mauro make repairs to their damaged building. 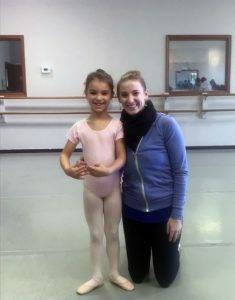 The efforts to help Mauro were in partnership with someone Hall studied dance with at the University of Kansas, Candice Michelle Franklin, a New York-based dance teacher who teaches at Mauro Youth Ballet in the summer. Hall said the hope is the clothes will allow the students to get back into the rhythm of attending ballet classes, especially if they lost their belongings in the hurricane. “Our young dancers love ballet and they love that they can share their love of dance with students many miles away,” Hall said. One young dancer who enthusiastically supported the clothing drive was 7-year-old Genevieve Hoffmann, first-grader at Brookwood Elementary School. In lieu of presents for herself at her seventh birthday party, Hoffmann collected donations for Mauro. As soon as her dance teacher told her about the situation in Puerto Rico, Hoffmann said she knew she wanted to help get the people of Mauro back to what they love — dancing. She also has a personal connection to Puerto Rico. “I thought asking for donations for the ballet for my birthday would make my Grandpa Cuevas proud, because he is Puerto Rican,” she added. While it took some extra effort to convince some people that Hoffmann really wanted donations for her birthday, in the end, her friends showed up to her Lost Boyz/Peter Pan birthday party Nov. 17 loaded down with ballet slippers and leotards. “When I brought in my donations to the studio, it made me feel full of joy,” Hoffmann said. Alexia Lang is a multimedia journalist who has worked in newspapers, magazines, radio and blogs. She holds a journalism degree from UMKC and her Master’s work is in Leadership.